SHUTTING ITSELF OFF when a car gasoline tank is full, an automatic filling-station hose nozzle prevents tanks from overflowing and spilling gasoline over fenders to spot the finish and waste fuel and money. Inserted in the filler neck of a gas tank, the nozzle is opened by a hand valve as with ordinary nozzles. When the gas tank is full, gasoline starts to rise in the filler neck. As soon as it reaches the level of the tip of the filler spout, an automatic valve shuts off the flow. The device speeds up filling-station service. 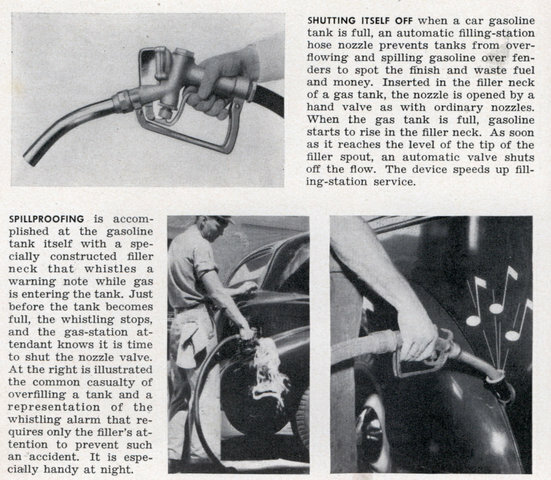 SPILLPROOFING is accomplished at the gasoline tank itself with a specially constructed filler neck that whistles a warning note while gas is entering the tank. Just before the tank becomes full, the whistling stops, and the gas-station attendant knows it is time to shut the nozzle valve. 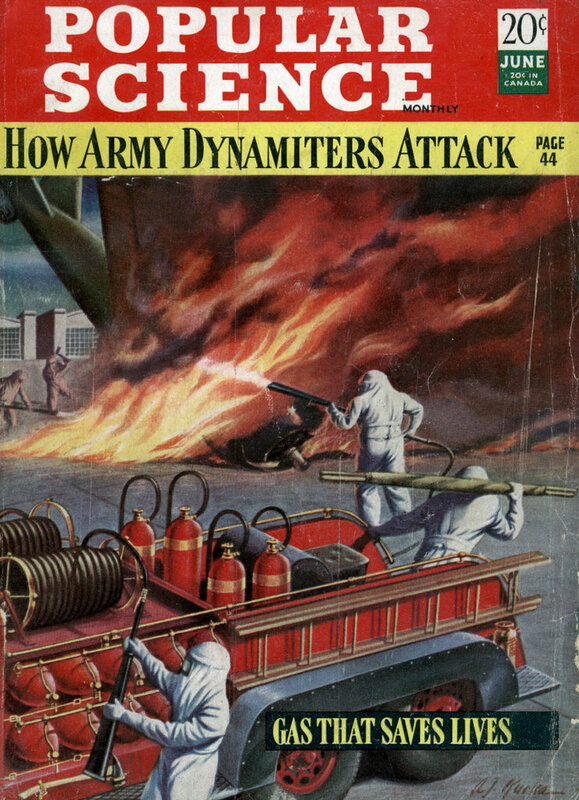 At the right is illustrated the common casualty of overfilling a tank and a representation of the whistling alarm that requires only the filler’s attention to prevent such an accident. It is especially handy at night. Yes, because drawing musical notes on a picture of a car clearly shows that it has a device installed. Many home-heating-oil tanks have the whistling device, which performs the exact function described in the article.